The AP7131 802.11n Wireless Access Point delivers the throughput, coverage and resiliency required to build an all-wireless enterprise. 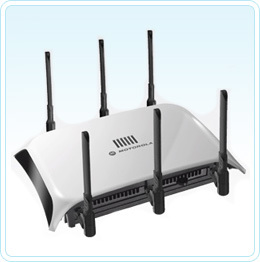 The tri-radio design provides simultaneous support for high-speed wireless voice and data services, self-healing mesh networking and non-data applications such as Motorola’s Wireless IPS. The fully DFS-compliant 802.11n Draft 2.0 device offers speeds up to 600 Mbps per access point — six times the bandwidth of an 802.11a/g access point. And Adaptive AP provides unparalleled resiliency and flexibility, enabling the AP7131 to be deployed as either a stand-alone wireless access point or adopted by a Motorola wireless switch for centralised configuration and management.